HomeNewsROCKSTAR ENERGY HUSQVARNA FACTORY RACING OFF ROAD’S COLTON HAAKER VICTORIOUS AT COSTA MESA ENDUROCROSS! Rockstar Energy Husqvarna Factory Racing Off Road’s Colton Haaker domionated the Costa Mesa EnduroCross, the second round of the series, held in Costa Mesa, Calif. on Saturday. After winning his heat, he climbed his way to the top of the bracket races to take the extra championship point. 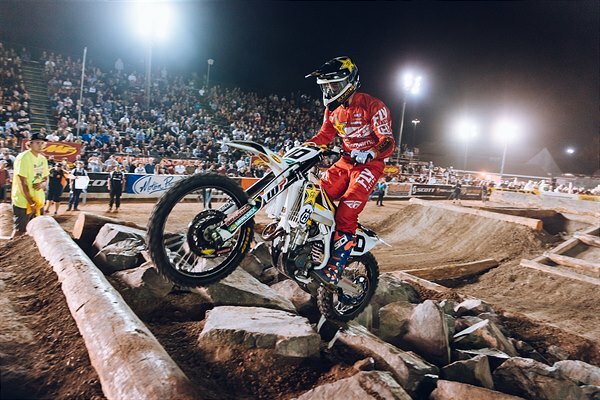 He then carried the momentum into the Super EnduroCross Main where he put on a heroic come-from-behind ride and defeated the competiton to take home his first win of the season. Haaker quickly went from fourth to first at the start of the second heat and pulled away, then held strong to take the win. He pulled a massive holeshot in his first bracket race to take the win, earned another victory in his second bracket race, and then lined up for the final bracket in the hopes to earn the important extra championship point. He took the early lead in the final bracket and held his ground to take the extra point. He was second at the start of the Super EnduroCross Main, but then went down shortly after the start which put him at the back of the pack. He put on a heroic ride and made his way back through the field and was one bike length behind the leader by lap seven. He went to battle and made an impressive pass for the lead right after the finish line the following lap, then pulled a gap and held strong to take the win.